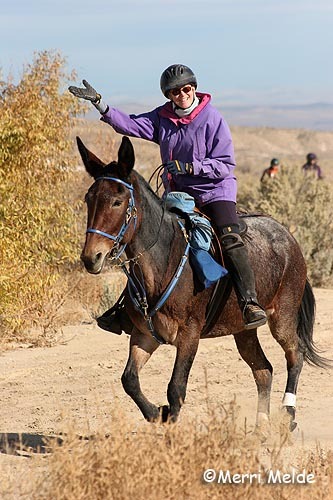 Ann Kuck of Star, Idaho, discovered the sport of endurance riding in 2005 from the back of her big bay molly mule, Lamplighter Hot Stuff, whom she'd gotten as a yearling. 'Stuffy' was out of a quarter horse mare and a mammoth jack. "She was a pretty big girl - a bit over 15 hands," says Ann. "I quit measuring her when she turned three because it was getting too scary to know how far off the ground I was sitting (and how far it was to fall)." Ann and her big girl shared the joys of 1280 miles of endurance trails over 8 seasons in the Northwest - and then something went wrong. Hot Stuff's bone marrow had stopped producing red blood cells in July of 2013. "There was nothing we could do to cure the condition that she had, and it could not be managed in a way that would keep her comfortable," Ann says; and tragically, she had to say goodbye to her 23-year-old partner. A member of AERC (American Endurance Ride Conference), and SWIT&DR (Southwest Idaho Trail and Distance Riders) since 2005, and Vice-President of SWIT&DR for the last 3 years, Ann had been trying to think of new ways to encourage new riders, who might not know about endurance, to come to some rides and see what endurance is all about. Most Idaho endurance rides offer welcoming Trail Rides (distances of 10 to 15 miles), so that 'newbies' and their horses get to experience the flavor of endurance riding - from the camping with their horse in Ridecamp, the commotion of horses and riders coming and going different distances and different directions throughout the day, following marked trails, going through a vet check, and of course enjoying the camaraderie, dinners, and awards afterwards. "Most new folks probably won't just enter a Limited Distance or Endurance ride to start with, but maybe they would enjoy a trail ride," Ann comments. 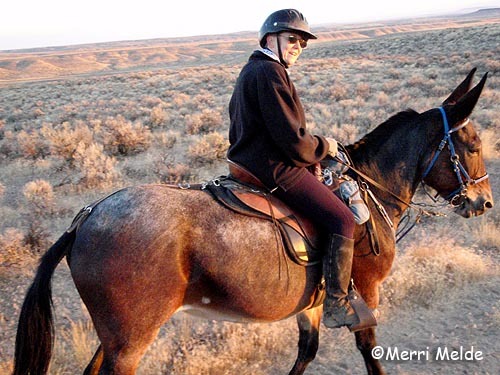 "I decided to fund the 'Hot Stuff Memorial Trail Rider Encouragement Fund' to see if we can nudge folks into coming out to explore the places that we enjoy, and to meet others who ride endurance, LD or trail rides. I am hoping that, if we can help with some of the expense, we can encourage more new people to join in on all our fun." This year in the SWIT&DR rides, Ann is subsidizing the ride registrations for trail riders with $10.00, up to 10 riders (total of $100.00). Ann would like to give priority to new trail riders, but, she said, "I really don't care who does a trail ride. The subsidy can be used by any trail rider." At the first Northwest ride of the 2015 season, the Owyhee Tough Sucker I in Oreana, Idaho, on April 4, "We had four new trail riders!" Ann reports. "I know that two of the new trail riders are from The Western Riding Club and they had a great time. They were planning to attend their monthly WRC meeting [the same evening,] and I hope they gave a great report." The Western Riding Club of Idaho calls itself the "Oldest Family Riding Club in Idaho," and the group convenes to take on trail challenges, day and overnight rides, poker rides, parades, playdays, and more. Ann is excited to be able to give back to the sport in which she shared so many wonderful memories looking down the trails through Hot Stuff's big ears. Part of Ann's family is gone now, but with her generous offer to new riders, the memories live on.